Beyond ‘Run, Knit and Relax’: Can Health Promotion in Canada Advance the Social Determinants of Health Agenda? Can health promotion in Canada effectively respond to the challenge of reducing health inequities presented by the WHO Commission on Social Determinants of Health? Against a background of failure to take seriously issues of social structure, I focus in particular on treatments of stress and its effects on health, and on the destructive congruence of Canadian health promotion initiatives with the neoliberal "individualization" of responsibility for (ill) health. I suggest that the necessary reinvention of the health promotion enterprise is possible, but implausible. The remarkable 2008 report of the who commission on social determinants of Health ("the Commission"), chaired by Sir Michael Marmot, began with the observation that "social injustice is killing people on a grand scale" (Commission 2008; for an overview, see Marmot et al. 2008). As suggested by the reference to social justice, the Commission's approach was explicitly and unapologetically normative, organized around the imperative of eliminating health inequities – "systematic differences in health" that "are judged to be avoidable by reasonable action." Perhaps unfortunately, the Commission did not elaborate on the major philosophical arguments in support of this position, or on what might constitute "reasonable action" and who should define it. Unfortunately as well, the Commission did not pay much attention to issues of implementation beyond calling for a global social movement. However, it is clear that the Commission was willing to challenge underlying economic and social inequalities and the processes that generate and sustain them. Its report characterized the "unequal distribution of health-damaging experiences" as "not in any sense a 'natural' phenomenon but … the result of a toxic combination of poor social policies and programmes, unfair economic arrangements, and bad politics" (Commission 2008: 1). Shortly after the Commission's report appeared, Australian researcher Frances Baum, who had been a member of the Commission, wrote that implementing its recommendations would require "reinventing health promotion for the twenty-first century" with a focus on macro-level aspects of social organization, as "the core of a social movement which advocates for new healthy, equitable and sustainable economic and social structures globally and within countries" (Baum 2008). In this paper, I explore key challenges in the Canadian context to the reinvention that Baum suggests, focusing on how health promotion continues to emphasize individual-level factors and behavioural rather than structural interventions. I suggest that although the reinvention in question is not impossible, it is implausible. Against that background, it is worthwhile to rethink the future of the health promotion enterprise as a whole. Although a solid historical sociology of the post-1986 institutionalization of health promotion has yet to be written, useful observations are provided in the second edition of a widely cited book, Health Promotion in Canada (O'Neill et al. 2007a). In one of the overview chapters, O'Neill and Stirling (2007: 35) note that a terminological shift from the earlier vocabulary of health education to health promotion recognizes the limits of "just working to change individual lifestyles," but little evidence suggests that the terminological shift has meant anything in practice. Indeed, the book's editors concede that "the practice of health promotion in all jurisdictions has still largely been based on individual lifestyle change" (Dupéré et al. 2007: 373), and the authors of one of the few chapters that is cautiously critical of health promoters' emphasis on "personal skills" and individual-level risk factors concede that a "larger focus on increasing the options available to people to exercise more control over their own health and their environments … has been, for the most part, more evident in rhetoric than in practice" (Frohlich and Poland 2007: 47; see also Low and Thériault 2008). This is the phenomenon described by British researchers Popay and colleagues (2010) as lifestyle drift: "the tendency for policy to start off recognizing the need for action on upstream social determinants of health inequalities only to drift downstream to focus largely on individual lifestyle factors." Lifestyle drift is endemic in Canadian health promotion and public health; only a few examples can be presented here. A report on how to make the province of Ontario a leader in population health argues for a focus on improved health behaviours such as healthy eating, physical activity, maintaining healthy body weight, avoiding tobacco and reducing stress (Manuel et al. 2009). The authors acknowledge that "[i]t is fundamentally unfair to try and change social attitudes or to tell poor people they should take more responsibility for their health if governments do not remove societal barriers which might prevent them from doing so" (Manuel et al. 2009: 6). However, in the text of the document as a whole there is one reference to poverty, one to unemployment, no reference to food insecurity (despite a substantial body of research on the topic; see, e.g., Dachner and Tarasuk 2002; Kirkpatrick and Tarasuk 2009; Tarasuk and Vogt 2009; Tarasuk et al. 2009), but 65 to health behaviours, health behaviour strategies, health behaviour targets and the like. A survey of initiatives related to healthy eating and physical activity in Ontario and British Columbia (Gore and Kothari 2012) found a preponderance of lifestyle- or environment-based rather than structure-based initiatives, even using a broad and inclusive definition of the latter category – this despite an accumulation of research evidence that the pathways leading to overweight and obesity are multiple and complex, and involve such factors as income distribution, various aspects of the built environment and the marketing strategies of the food and beverage industries, as well as "individual responsibility" (Glickman et al. 2012; Moodie et al. 2013; Shih et al. 2012). An especially egregious example of indifference to structural factors involves a widely neglected mechanism of influence on individual health and two high-profile organizations: the Heart and Stroke Foundation (HSF) and the Canadian Mental Health Association (CMHA), which are among Canada's largest health-related non-profits. The initiative in question, which serves to illuminate key issues related to how health promoters attribute responsibility for health and illness, is a brochure, "Coping with Stress" (HSF and CMHA 2009), that begins with a 25-item stress quiz (Table 1). The individualized focus of this checklist is indicated by the generic "Do you" prefix (emphasis added): every item focuses on the behaviour of the person experiencing stress, not on its sources. The brochure then warns people with high scores to "Stop. Re-think. Change your lifestyle. Improve your diet. Make physical activity a regular routine, and above all, try to find ways to relax. Is it running? Knitting? Spending time with your kids? Try to positively alter your attitudes." Readers are further enjoined to "[w]atch out for stressors!" and "live healthy and to try to avoid things that cause [stress]," assuming that these options are routinely available. Lest there be any doubt about where responsibility for stress and its health consequences is located or what remedies are considered appropriate, readers are told that "[i]t's how we think, or react, that makes us feel over-stressed" (emphasis added), but that doctors – or, if financial concerns are a source of stress, credit counselling services – can help. Neglect your diet? Use sleeping pills or tranquillizers without consulting a doctor? Try to do everything yourself? Not get enough rest? Blow up easily? Get angry when you are kept waiting? Seek unrealistic goals? Ignore stress symptoms in your habits and attitudes? Fail to see the humour in situations others find funny? Put things off until later? Act rude? Think there is only one right way to do something? Make a "big deal" of everything? Fail to include relaxation time in your day? Look to other people to make things happen? Gossip? Have difficulty making decisions? Impatiently try to race through your day? Complain you are disorganized? Spend a lot of time complaining about your past? Avoid people whose ideas contradict your own? Fail to get a break from noise and crowds? Bottle up everything inside? Score 1 for each "YES" answer. Avoid or neglect physical activity? Have few or no supportive relationships? Source: HSF and CMHA 2009. It is useful to contrast this approach with Marmot's eloquent description of how daily financial exigencies and the threat of job loss – factors that are increasingly widespread and entirely out of the control of those experiencing their consequences – affect line workers, on the one hand, and factory owners/managers, on the other; and of how combining the contrast with well-established findings about the physiology of stress helps to explain socio-economic gradients in health that are ubiquitous in societies rich and poor alike (Marmot 2004: 109–41). Marmot made his name in epidemiology by way of two prospective studies that identified socio-economic gradients in a wide variety of health outcomes among British public servants who were conspicuously not exposed to such material hazards as serious undernourishment, chronically insecure and precarious employment, or gender discrimination (at least in the case of the Whitehall I cohort, who were all male). Socio-economic gradients were central to the descriptive work of the WHO Commission that he subsequently chaired. Two evocative sets of research findings, generated using quite different methodologies, demonstrate the value of Marmot's perspective. First, after 1996 US welfare "reform" legislation dismantled decades-old guarantees of income support (Newman and Massengill 2006; Ridzi and London 2006; Seccombe 2009), social scientists used "geo-ethnography," a combination of ethnographic fieldwork with the use of geographic information systems, to generate narratives and maps of the daily activities of more than 200 families in three cities (Matthews et al. 2005). 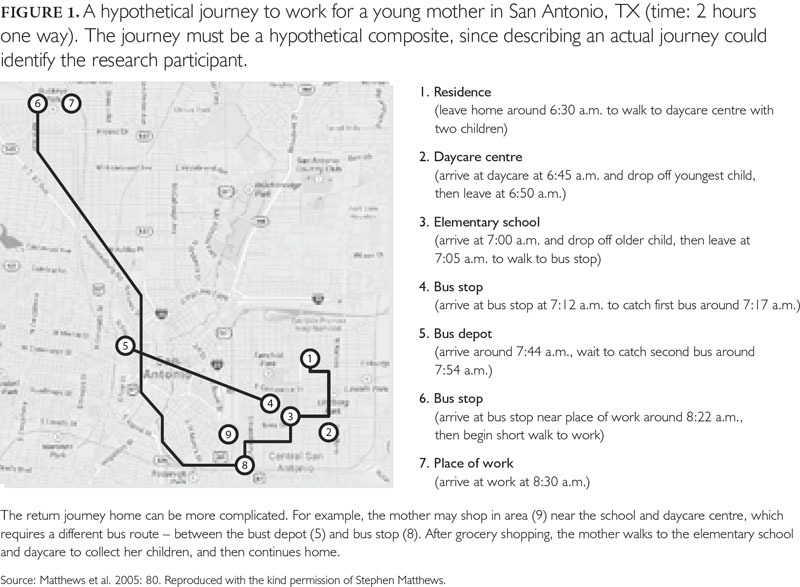 A hypothetical composite map of the daily activities of a single mother with two small children reveals a day that consists of leaving home at 6:30 a.m. to drop off children at daycare and school, followed by a bus trip of more than an hour to arrive at a place of work more than five miles away by 8:30 a.m. 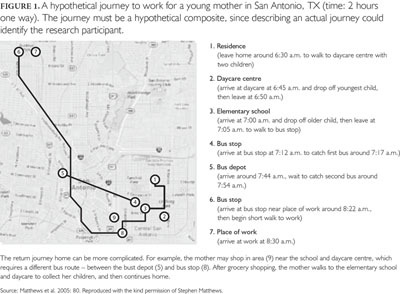 The researchers drily noted that "[t]he return journey home can be more complicated," for example, if grocery shopping – via a different bus route – has to be done (Figure 1). Not a lot of time is left for "find[ing] ways to relax," as HSF and CMHA would have us do. The picture generated by geo-ethnography is a static or short-term one; a significant insight from population health research is that the consequences of various forms of adversity accumulate over the life course (Bartley et al. 2006; Blane 2006; Hertzman and Power 2005; Morenoff and Lynch 2004;). In the second set of findings, Geronimus and colleagues (2006)used 10 indicators of allostatic load – a key concept in the physiology of stress (McEwen 2000, 2007) – to generate allostatic load scores for participants in a national survey in the US. Scores were higher for the poor than for the non-poor, and higher for Blacks than for Whites in all age groups, an effect that was not explained by the higher prevalence of poverty among Blacks. Scores of Black women were consistently higher than for Black men; scores increased over the life course for all groups, but scores were highest, and the increase over the life course most pronounced, among Black women. Strikingly, "[i]n each age group, the mean score for Blacks was roughly comparable to that for Whites who were 10 years older" (Geronimus et al. 2006: 831). These findings are strongly supportive of the proposition that stresses attached to subaltern positions in a society that is stratified on multiple dimensions (i.e., by income, race and gender) wear out the human body over time in biologically measurable ways. The individualized focus of health promotion does not necessarily rest on explanations of patterns of population health that are wrong, in the sense that they are falsifiable, although they may be seriously incomplete. That focus does, however, reflect choices not to look too far or too inquisitively for what Rose (1992) famously termed the "causes of the causes" of health disparities – a concept that was central to the thinking of the WHO Commission (2007). Whatever values or politics drive such choices, they must be defended on that terrain, i.e., as what Shrader-Frechette and McCoy (1993: 84–101) describe as methodological value judgments – that is, decisions about research design that are not grounded solely in the canons of science qua science. (This does not mean that the work that ensues is in any sense unscientific; studies using different methodologies will yield quite different kinds of results even if each is exemplary in terms of the chosen methodology.) And because the aim of health promotion is to be regarded as in some way authoritative – a health promoter to whom no one listens is by definition ineffective – the choices must also be interrogated as exercises of power that define the boundaries of "permissible political discourse" (Walker 1986: 1237). The values and boundaries in question are, if not derived from neoliberalism, then at least congruent with it. Neoliberalism, which has come to dominate the policy environment of the last few decades, is the doctrine that markets are the normal, natural and preferable way of organizing most forms of human interaction; that any departure from markets and the allocation of resources they generate requires justification to a high standard of proof; and that the primary function of the state is to ensure the functioning of markets, even when this requires intrusive or coercive measures (Peck and Tickell 2002; Robinson 2003: 147–294; Somers 2008: 73–92; Wacquant 2009: 304–14; Ward and England 2007). Ward and England (2007) analyze neoliberalism as comprising simultaneously a policy or program, a pattern of reorganizing state institutions and an ideology. The ideological element is essential to securing consent, or at least acquiescence, to the neoliberal reorganization of social institutions, exemplified by the post-1980 retreat from social provision in Canada and elsewhere, which has compounded the effects of growing inequalities in market income. An indispensable treatment of the neoliberal reconstruction of public policy in Canada, and the ways we think about it, provides a finer-grained description of that ideological element in terms of individualization: "the process whereby a broad range of social issues is being reconstituted, both with respect to causes and solutions, in highly individualized terms. Healthcare and poverty are treated as individual shortcomings, products of poor individual choices, to be remedied by emphasizing individual responsibility" at the expense of social and structural analyses (Fudge and Cossman 2002: 21–22, citations omitted). In the health policy context the effect, if not the intent, of individualization is to divert attention from what Diderichsen and colleagues (2001), in a discussion of social disparities in health that informed the work of the WHO Commission, described as "those central engines in society that generate and distribute power, wealth, and risks." Canadian health promoters appear reluctant to engage directly with questions of how those engines operate, or who operates them. Indeed, the introduction to the text cited earlier treats the post-1990 assault on the welfare state as a "general trend" (O'Neill et al. 2007b: 11), without further inquiry into its origins or beneficiaries. The trend is more accurately and responsibly viewed as part of a process of fundamental social reorganization, driven by specific domestic and international economic interests, that is directly relevant to the future of population health and the distribution of opportunities to lead a healthy life (Benatar et al. 2011; Harvey 2006). Practical manifestations of this political reluctance include the fact that programs to promote healthy eating ignore the simple affordability of a healthy diet for people like those reliant on social assistance (as shown by Association of Local Public Health Agencies 2009; Ottawa Public Health 2012; Dietitians of Canada 2012; Williams et al. 2012). For HSF and CMHA, it is individuals' responsibility to make healthy choices about coping with stress and its origins. Nothing is said about the origins of stress in social organization: how and why labour markets are reducing employment security and expanding precarious employment (Vosko 2006); the fact that market incomes are stagnant or declining for much of the population (Yalnizyan and Schrecker 2010); that Canadian governments have retreated from redistributive social policies, which had the potential to offset increases in market income inequality (Heisz 2007; OECD 2011); and that public sector spending cuts, driven by the perceived imperative of deficit reduction, complicate the daily lives of those who rely on such services as public transportation, social housing and subsidized child care. The "run, knit and relax" prescription may be an extreme example, albeit one that emanates from thoroughly mainstream organizations, or it may not be; a systematic content analysis of the health promotion messages emanating from all major non-profits would be valuable. Nevertheless, it is clear that the operating assumptions of health promotion as it has evolved in Canada routinely instantiate what Fudge and Cossman (2002) call individualization. Conversely, these assumptions are incompatible with one of the WHO Commission's three overarching recommendations: to "tackle the inequitable distribution of power, money, and resources." This contrast may be attributable, in part, to the institutional location of key practitioners, many of whom work in departments or agencies of government that are subject to strict political direction and control, and have little direct influence on broader social determinants of health. However, this cannot explain or excuse the indifference to structural issues of academic researchers or of non-profits. The contrast may also reflect protagonists' training in such disciplines as medicine, nursing or epidemiology, which are (with rare exceptions) relentlessly focused on the individual patient or client, and on micro-level interventions that address just one aspect of daily life, with the randomized controlled trial as the gold standard (for a discussion of the limits of this focus in the context of preventing mental illness, see Schrecker et al. 2001). The social position of researchers and practitioners may also be an issue. As an academic with a long history of precarious employment, I have spent much time over the past several years slowly and carefully explaining to supremely comfortable colleagues who own vacation homes how unemployment and economic insecurity might adversely affect health. Such colleagues are, to put it mildly, ill-equipped to respond to Donna Haraway's memorable injunction about "trusting especially the vantage points of the subjugated; there is good reason to believe vision is better from below the brilliant space platforms of the powerful" (Haraway 1988: 583) – a course of action that would seem indispensable to any serious effort to carry forward the Commission's equity-oriented agenda. And the fact that explanations of the importance of structural influences are necessary does not augur well for the reinvention of health promotion that Baum (2008) proposes. In the Canadian context, that reinvention will require that health promoters acquire a higher level of methodological self-consciousness; recognize the congruence of their current focus with the presumptions of neoliberalism; and rethink that focus in a way that explicitly confronts neoliberalism and articulates alternatives at the levels of policy formation and quotidian practice. Such reinvention is possible, but implausible. A number of Canadians working in health promotion concede the inadequacy of more than two decades' worth of gestures towards taking structure seriously, but conceding the inadequacy of one's past approach is one thing; changing course in an increasingly inhospitable political climate is quite another. Meanwhile, an urgent corollary arises from a basic axiom in health ethics: first, do no harm. At issue is not just a shift in emphasis, but a contest among incommensurable paradigms in the Kuhnian sense. Health promotion initiatives that neglect structural influences on health and reinforce or legitimize neoliberal attributions of responsibility are not just irrelevant to the health equity agenda advanced by the WHO Commission; they are actively destructive of that agenda and its commitment to social justice. If such initiatives cannot be reinvented quickly and comprehensively, it is worth considering whether equity would be best served by shutting them down. Au-delà de « courir, tricoter et relaxer »: la promotion de la santé au Canada peut-elle faire progresser les déterminants sociaux du programme de santé? La promotion de la santé au Canada peut-elle vraiment relever le défi d'une réduction des inégalités en matière de santé, tel que présenté par la commission des déterminants sociaux de la santé de l'OMS? Dans le contexte où les enjeux de la structure sociale ne sont pas vraiment pris au sérieux, je me penche sur le traitement du stress et ses effets sur la santé ainsi que sur la congruence destructive entre les initiatives canadiennes de promotion de la santé et l'« individualisation » néolibérale des responsabilités quant à la (mauvaise) santé. J'avance qu'une réinvention nécessaire du projet de promotion de la santé est possible, bien que peu plausible. Correspondence may be directed to: Ted Schrecker, Professor of Global Health Policy, School of Medicine, Pharmacy and Health, Durham University, Stockton-on-Tees, UK; e-mail: tschrecker@gmail.com. Parts of this argument were presented at seminars organized by the International Health Office, Dalhousie University and the Department of Community Medicine and Humanities, Memorial University (March 2009) and at the Second Biennial Conference of the Canadian Society for the Sociology of Health (Ottawa, October 2010). Comments received there; subsequently from Sharon Batt on a very early version of the paper; and from anonymous reviewers improved the argument substantially. All views not attributed to cited authors are exclusively my own. Association of Local Public Health Agencies. 2009. "Information Package for Local Public Health Agencies: Put Food in the Budget Campaign." Retrieved June 20, 2013. <http://www.rrasp-phirn.ca/images/fbfiles/files/CNFB_2009_Information_Package.pdf>. Bartley, M., J. Ferrie and S.M. Montgomery. 2006. "Health and Labour Market Disadvantage: Unemployment, Non-Employment, and Job Insecurity." In M. Marmot and R.G. Wilkinson, eds., Social Determinants of Health (2nd ed.) (pp. 78–96). New York: Oxford University Press. Baum, F. 2008. "The Commission on the Social Determinants of Health: Reinventing Health Promotion for the Twenty-First Century?" Critical Public Health 18: 457–66. Benatar, S.R., S. Gill and I. Bakker. 2011. "Global Health and the Global Economic Crisis." American Journal of Public Health 101: 646–53. Blane, D. 2006. "The Life Course, the Social Gradient, and Health." In M. Marmot and R.G. Wilkinson, eds., Social Determinants of Health (2nd ed.) (pp. 54–77). New York: Oxford University Press. Commission on Social Determinants of Health. 2007. Achieving Health Equity: From Root Causes to Fair Outcomes. Interim Statement. Geneva: World Health Organization. Retrieved June 20, 2013. <http://www.who.int/social_determinants/resources/csdh_media/csdh_interim_statement_07.pdf>. Commission on Social Determinants of Health. 2008. Closing the Gap in a Generation: Health Equity through Action on the Social Determinants of Health. Final Report. Geneva: World Health Organization. Retrieved June 20, 2013. <http://whqlibdoc.who.int/publications/2008/9789241563703_eng.pdf>. Dachner, N. and V. Tarasuk. 2002. "Homeless 'Squeegee Kids': Food Insecurity and Daily Survival." Social Science and Medicine 54: 1039–49. Diderichsen, F., T. Evans and M. Whitehead. 2001. "The Social Basis of Disparities in Health." In M. Whitehead, T. Evans, F. Diderichsen, A. Bhuiya and M. Wirth, eds., Challenging Inequities in Health: From Ethics to Action (pp. 13–23). New York: Oxford University Press. Dietitians of Canada. 2012. "Cost of Eating in British Columbia 2011." Retrieved June 20, 2013. <http://www.dietitians.ca/Downloadable-Content/Public/CostofEatingBC2011_FINAL.aspx>. Dupéré, S., V. Ridde, S. Carroll, M. O'Neill, I. Rootman and A. Pederson. 2007. "Conclusion: The Rhizome and the Tree." In M. O'Neill, A. Pederson, S. Dupéré and I. Rootman, eds., Health Promotion in Canada: Critical Perspectives (pp. 371–88). Toronto: Canadian Scholars' Press. Frohlich, K.L. and B. Poland. 2007. "Points of Intervention in Health Promotion Practice." In M. O'Neill, A. Pederson, S. Dupéré and I. Rootman, eds., Health Promotion in Canada: Critical Perspectives (pp. 46–60). Toronto: Canadian Scholars' Press. Fudge, J. and B. Cossman. 2002. "Introduction: Privatization, Law, and the Challenge to Feminism." In B. Cossman and J. Fudge, eds., Privatization, Law, and the Challenge to Feminism (pp. 3–40). Toronto: University of Toronto Press. Geronimus, A.T., M. Hicken, D. Keene and J. Bound. 2006. "'Weathering' and Age Patterns of Allostatic Load Scores among Blacks and Whites in the United States." American Journal of Public Health 96: 826–33. Glickman, D., L. Parker, L.J. Sim, H.D.V. Cook and E.A. Miller, eds. 2012. Accelerating Progress in Obesity Prevention: Solving the Weight of the Nation. Washington, DC: National Academies Press for the Institute of Medicine. Gore, D. and A. Kothari. 2012. "Social Determinants of Health in Canada: Are Healthy Living Initiatives There Yet? A Policy Analysis." International Journal for Equity in Health 11: 41. Haraway, D. 1988. "Situated Knowledges: The Science Question in Feminism and the Privilege of Partial Perspective." Feminist Studies 14: 575–99. Harvey, D. 2006. "Neo-Liberalism and the Restoration of Class Power." In Spaces of Global Capitalism (pp. 9–68). London: Verso. Heart and Stroke Foundation (HSF) and Canadian Mental Health Association (CMHA). 2009. "Coping with Stress." Retrieved June 20, 2013. <http://www.heartandstroke.com/atf/cf/%7B99452D8B-E7F1-4BD6-A57D-B136CE6C95BF%7D/coping-with-stress-en.pdf>. Heisz, A. 2007. Income Inequality and Redistribution in Canada: 1976 to 2004. Analytical Studies Branch Research Paper Series No. 298. Ottawa: Statistics Canada. Retrieved June 20, 2013. <http://www.statcan.gc.ca/pub/11f0019m/11f0019m2007298-eng.pdf>. Hertzman, C. and C. Power. 2005. "A Life Course Approach to Health and Human Development." In J. Heymann, C. Hertzman, M.L. Barer and R.G. Evans, eds., Healthier Societies: From Analysis to Action (pp. 83–106). New York: Oxford University Press. Kirkpatrick, S.I. and V. Tarasuk. 2009. "Food Insecurity and Participation in Community Food Programs among Low-Income Toronto Families." Canadian Journal of Public Health 100: 135–39. Low, J. and L. Thériault. 2008. "Health Promotion Policy in Canada: Lessons Forgotten, Lessons Still to Learn." Health Promotion International 23: 200–6. Manuel, D., M.I. Creatore, L.C.A. Rosella and D.A. Henry. 2009. "What Does It Take to Make a Healthy Province? A Benchmark Study of Jurisdictions in Canada and around the World with the Highest Levels of Health and the Best Health Behaviours." Toronto: Institute for Clinical Evaluative Sciences. Retrieved June 20, 2013. <http://www.ices.on.ca/file/Healthy%20province%20November%20release.pdf>. Marmot, M. 2004. Status Syndrome: How Your Social Standing Directly Affects Your Health and Life Expectancy. London: Bloomsbury. Marmot, M., S. Friel, R. Bell, T.A. Houweling and S. Taylor. 2008. "Closing the Gap in a Generation: Health Equity through Action on the Social Determinants of Health." Lancet 372: 1661–69. Matthews, S.A., J.E. Detwiler and L.M. Burton. 2005. "Geo-Ethnography: Coupling Geographic Information Analysis Techniques with Ethnographic Methods in Urban Research." Cartographica 40: 75–90. McEwen, B.S. 2000. "The Neurobiology of Stress: From Serendipity to Clinical Relevance." Brain Research 886: 172–89. McEwen, B.S. 2007. "Physiology and Neurobiology of Stress and Adaptation: Central Role of the Brain." Physiological Reviews 87: 873–904. Moodie, R., D. Stuckler, C. Monteiro, N. Sheron, B. Neal, T. Thamarangsi et al. 2013. "Profits and Pandemics: Prevention of Harmful Effects of Tobacco, Alcohol, and Ultra-Processed Food and Drink Industries." Lancet 381: 670–79. Morenoff, J.D. and J.W. Lynch. 2004. "What Makes a Place Healthy? Neighborhood Influences on Racial/Ethnic disparities in Health Over the Life Course." In N.B. Anderson, R.A. Bulatao and B. Cohen, eds., Critical Perspectives on Racial and Ethnic Differences in Health in Late Life. Washington, DC: National Academies Press. Newman, K.S. and R.P. Massengill. 2006. "The Texture of Hardship: Qualitative Sociology of Poverty, 1995–2005." Annual Review of Sociology 32: 423–46. O'Neill, M., A. Pederson, S. Dupéré and I. Rootman, eds. 2007a. Health Promotion in Canada: Critical Perspectives. Toronto: Canadian Scholars' Press. O'Neill, M., A. Pederson, S. Dupéré and I. Rootman, I. 2007b. "Introduction: An Evolution in Perspectives." In M. O'Neill, A. Pederson, S. Dupéré and I. Rootman, eds., Health Promotion in Canada: Critical Perspectives (pp. 1–15). Toronto: Canadian Scholars' Press. O'Neill, M. and A. Stirling. 2007. "The Promotion of Health or Health Promotion." In M. O'Neill, A. Pederson, S. Dupéré and I. Rootman, eds., Health Promotion in Canada: Critical Perspectives (2nd ed.) (pp. 32–45). Toronto: Canadian Scholars' Press. Organisation for Economic Co-operation and Development (OECD). 2011. "Divided We Stand: Why Inequality Keeps Rising." Retrieved June 20, 2013. <http://www.oecd.org/els/soc/49177689.pdf>. Ottawa Public Health. 2012. "The Price of Eating Well in Ottawa 2012." Retrieved June 20, 2013. <http://app06.ottawa.ca/calendar/ottawa/citycouncil/obh/2012/11-19/Report%20B%20-%20Supporting%20Document%201%20EN.pdf>. Peck, J. and A. Tickell. 2002. "Neoliberalizing Space." Antipode 34: 380–404. Popay, J., M. Whitehead and D.J. Hunter. 2010. "Injustice Is Killing People on a Large Scale – But What Is to Be Done about It?" Journal of Public Health 32: 148–49. Ridzi, F. and A.S. London. 2006. "'It's Great When People Don't Even Have Their Welfare Cases Opened': TANF Diversion as Process and Lesson." Review of Policy Research 23: 725–43. Robinson, W.I. 2003. Transnational Conflicts: Central America, Social Change, and Globalization. London: Verso. Rose, G. 1992. Strategy of Preventive Medicine. Oxford: Oxford University Press. Schrecker, T., L. Acosta, M.A. Somerville and H. Bursztajn. 2001. "The Ethics of Social Risk Reduction in the Era of the Biological Brain." Social Science and Medicine 52: 1677–87. Seccombe, K. 2009. "Life After Welfare Reform." In C.A. Broussard and A.L. Joseph, eds., Family Poverty in Diverse Contexts (pp. 48–63). New York: Routledge. Shih, M., K.A. Dumke, M.I. Goran and P.A. Simon. 2012. "The Association between Community-Level Economic Hardship and Childhood Obesity Prevalence in Los Angeles." Pediatric Obesity. doi: 10.1111/j.2047-6310.2012.00123.x. Shrader-Frechette, K.S. and E.D. McCoy. 1993. Method in Ecology: Strategies for Conservation. Cambridge: Cambridge University Press. Somers, M. 2008. Genealogies of Citizenship: Markets, Statelessness, and the Right to Have Rights. Cambridge: Cambridge University Press. Tarasuk, V., N. Dachner, B. Poland and S. Gaetz. 2009. "Food Deprivation Is Integral to the 'Hand to Mouth' Existence of Homeless Youths in Toronto." Public Health Nutrition 12: 1437–42. Tarasuk, V. and J. Vogt. 2009. "Household Food Insecurity in Ontario." Canadian Journal of Public Health 100: 184–88. Vosko, L., ed. 2006. Precarious Employment: Understanding Labour Market Insecurity in Canada. Montreal: McGill–Queen's University Press. Wacquant, L. 2009. Punishing the Poor: The Neoliberal Government of Social Insecurity. Durham, NC: Duke University Press. Walker, G.K. 1986. "Reforming Medicare: The Limited Framework of Political Discourse on Equity and Economy." Social Science and Medicine 23: 1237–50. Ward, K. and K. England. 2007. "Introduction: Reading Neoliberalization." In K. England and K. Ward, eds., Neoliberalization: States, Networks, Peoples (pp. 1–22). Oxford: Blackwell. Williams, P.L., C.G. Watt, M. Amero, B.J. Anderson, I. Blum, R. Green-LaPierre et al. 2012. "Affordability of a Nutritious Diet for Income Assistance Recipients in Nova Scotia (2002–2010)." Canadian Journal of Public Health 103: 183–88. Yalnizyan, A. and T. Schrecker. 2010. "The Growing Economic Gap: What It Means for Canadian Families and the Canadian Future." In R. Labonté, ed., Forgotten Families: Globalization and the Health of Canadians (pp. 112–27). Ottawa: Institute of Population Health, University of Ottawa. Retrieved June 20, 2013. <http://www.iph.uottawa.ca/eng/transdis/about.html>. Thank you for this excellent article, Professor Schrecker! It is far too seldom that we have articles published that get at the real cause of inequity and that place the emphasis where it is most warranted!